The closer Galactica came to Earth, the closer it came to God  or gods, or the absence thereof. 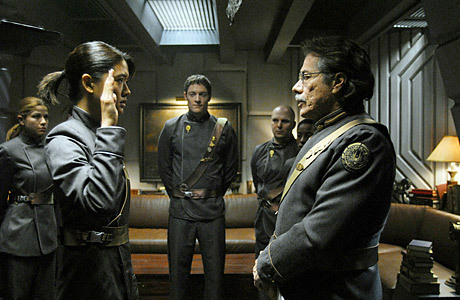 The space saga took an even more philosophical and religious turn in the first half of its second season, as human leader/traitor Gaius Baltar got a new start as a Messiah figure; President Roslin continued to pursue her prophesied vision of leading her decimated people to the Promised Planet; and Starbuck was tortured by her own vision of the route to Earth, which put her in conflict with her leader. Meanwhile, the monotheistic Cylons took a break from trying to exterminate their human creators and had a devastating civil war, after which one camp joined with their former enemies to find Earth. When they arrived  and found the planet a nuclear wasteland  BSG left us with questions: Do the gods speak to man or to machine? And do we really want to hear what they're telling us?